Practice anywhere with consistency with our Golf Practice Mats from Custom Turf Outlet which comes with free shipping! Available in a variety of sizes, these 1 1/4” Polypropylene practice mats give a realistic footing for swing practice or a moment away from the office. The lightweight durable material boasts durability and longevity for years of use. 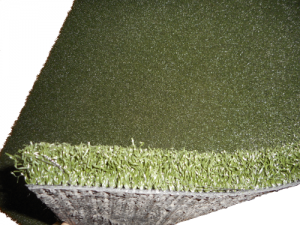 The thick and dense turf provides the choice to swing right off a real tee or from the turf itself for iron shots, further expanding the advantages of premium quality artificial turf. Order Your Golf Practice Mats Now! Practice in various fairway slope conditions by simply placing our Golf Practice Mats over naturally or artificially contoured terrain. Relaxation is joined by the added benefit of low impact exercise, as golf demands precision and finesse which in turn require access to the proper training equipment. Durable enough to be used in all conditions and affordable for the novice golfer. Work on your swing, in a small space in your backyard, attic or garage, this product brings the opportunity to train at your leisure around your schedule.